Popcorn and movies, movies and popcorn — it’s an eternal pairing. For decades, the two have seemed as inseparable as peanut butter and jelly, peas and carrots, Bonnie and Clyde. But that’s all changing. Movie theaters are increasingly distinguished from one another not just by which movies they’re playing but also by the food and beverage that’s on offer. At most places, you can still get popcorn, of course. But your neighbor might be munching on a panini, drinking a boozy milkshake, or snacking on a dessert specially created to accompany the movie you’re about to see. That’s not surprising. The percentage of theaters’ revenue attributable to concession sales has climbed steadily over the past few years, even as ticket sales have fallen. In 2016, AMC’s concessions sales crossed the $1 billion mark, up 12 percent from 2015 and 28 percent from 2014. In the same time period, ticket sales sank, with poorly reviewed films, ticket costs, and myriad at-home viewing options all contributing to the downturn. Popcorn isn’t always king at the movies anymore. 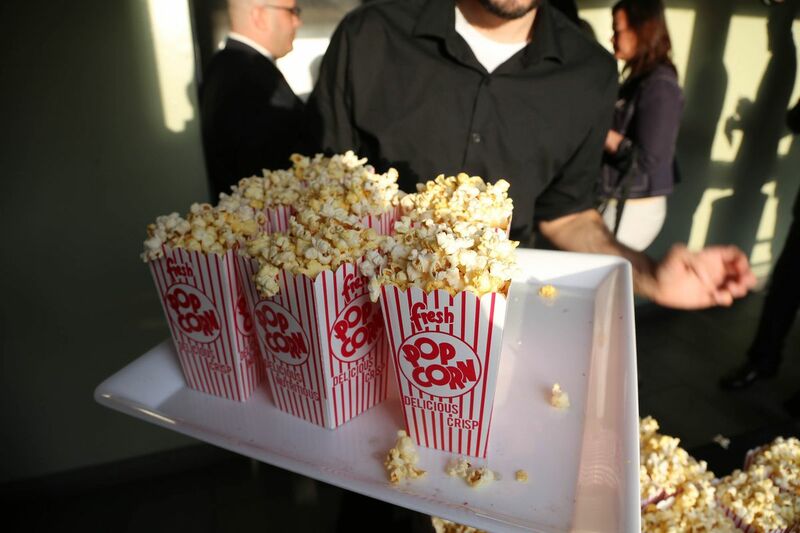 So concessions are an increasingly important part of the movie exhibition business, especially as experiments like MoviePass and movie ticket subscriptions change people’s viewing habits. How we watch movies on the big screen is changing, and along with it, the way we eat at the movies is changing too. Customers want to customize their experience — not just the movies they see but the food they eat while they’re seeing them. And if that increased focus on concessions helps save the movie theater business from going under, it won’t be the first time. In the 1930s, the movie theater business — once a booming industry — found itself on hard times, crippled by the Depression. People didn’t have money even for the relatively cheap form of entertainment they were peddling. Theaters started to close. But one type of theater survived: the kind that sold concessions. Some owners of fancier, higher-class movie theaters banned food, considering it to be beneath their business. But it turned out that theaters that peddled things like popcorn and candy were the ones that survived the Depression. This seems counterintuitive: Why were people spending more at the theater if money was tight? But those who could afford a ticket apparently liked the cheap snack, and the relatively low cost of the reigning king of the concession stand — popcorn — meant that theaters made a huge profit, which kept them afloat. By 1945, half of all popcorn in America was consumed in movie theaters. The movie theater business has had its highs and lows since then, of course — and right now, it’s in one of its slower periods. Movie theater attendance in the US hit a 25-year low in 2017, a drop likely attributable to a few factors: the soaring price of movie tickets, poor turnout during the blockbuster summer season, and the ever-present threat of streaming entertainment services like Netflix, which provide an inexpensive alternative to the theater. The Blue Startlite Mini Urban Drive-In in Miami offers some traditional concessions, with a twist. 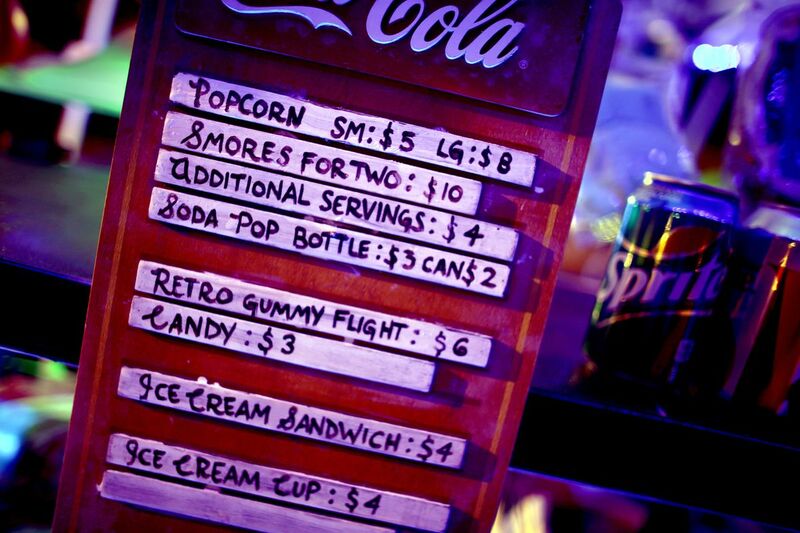 So it’s probably no surprise that movie theaters have been reinventing the ways they sell concessions too — especially since they pocket about 85 cents on the dollar, at least for conventional concessions. Not every food item can be sold at the sort of markup that cheap-to-make popcorn brings in, but the profit margin is still enticing (particularly for theaters that add alcohol to their menus). And that’s why, around the country, you can find independent theaters selling specialty cocktails and fancy snacks in the lobby; franchise chains like the Alamo Drafthouse cinemas, which serve up a full menu including alcohol during the meal; and even fancier fare at multiplex megachains like AMC and Regal, which in some locations are supplementing their standard popcorn and nachos routines with chicken and waffles, sliders, and paninis. If you want to see how these trends are playing out — and interacting with the shifting ways people attend theaters — New York City is the perfect test lab. There are plenty of standard multiplex cinemas scattered around the city, but they cohabitate with a new crop of independent theaters and repertory houses that have lately made it feel like New York movie culture is entering a new golden age. And as many of New York’s theaters tinker with the ways they sell food and drink to their customers, a few trends emerge. Cinemas are looking to larger, more complicated menus and innovating in the ways they use their spaces to not just feed patrons differently but lure them into the theater itself. I exchanged emails with a number of people who create, manage, and implement menus at both chains and independent cinemas around New York City. Most of them noted that while people have always enjoyed eating at the movies, something has shifted in the past decade or so: Theaters started thinking in new ways about what kinds of foods they could offer. Instead of sticking with the same traditional snack foods — popcorn, Junior Mints, Reese’s Pieces, Sour Patch Kids, fountain sodas — they’ve seen a huge expansion in what counts as movie food. “‘Dinner and a movie’ has been the go-to date night for decades, but it is only recently that exhibitors really embraced the idea of being the ones offering the dinner,” Ken Gillich, who is the senior director of food and beverage at Reading International and oversees the concessions at theaters including New York’s Angelika and City Cinemas locations, some of which offer cafe-style food as well as more traditional in-cinema concessions. What about a gourmet pizza with your movie? Both big multiplex chains and smaller independent theaters have widened their focus from snacks to full-on meals in recent years. AMC, for instance, launched its “Dine-In” brand about a decade ago, partly to compete with theaters like Alamo. In the past couple of years, AMC theaters have also started offering upgraded concessions (like flatbread pizzas and sliders) and, in some locations, alcoholic beverages. Some Regal Cinemas have also gotten in on the act, offering alcohol and fast-food staples like burgers and wings. This has resulted in a sizable profit bump for the chain as well, which helped smooth over the losses from plummeting ticket sales. But while chains like AMC and Regal have been testing concepts and varying the menu in locations around the country, it’s independent cinemas that have the most room for innovation and the ability to cater to their local community. Ragtag Cinemas in Columbia, Missouri — which helps host the highly respected True/False Film Festival every March — has two theaters: one small theater with couches and one a bit larger with more traditional seating. The theater is attached to a restaurant area that serves everything from banh mi and vegan baked goods to soup and kombucha, as well as a full bar with local and national beers and wines. Patrons can eat at the restaurants or on the patio, or bring their food and drink into the cinema. “It reminded me of a ‘larger’ home theater completed with couches … delicious snacks, food and drinks from Uprise Bakery on the way in, and human(!) announcer for upcoming shows. 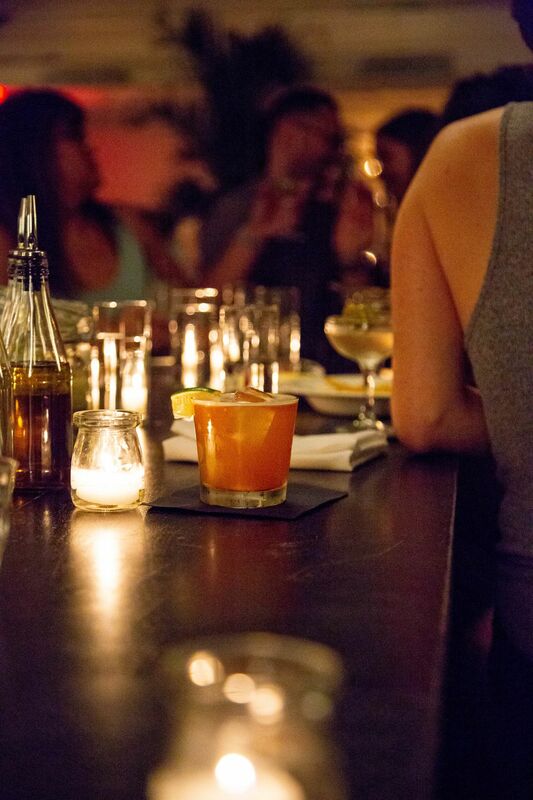 Hipster indeed!” one Yelp reviewer wrote. Alamo Drafthouse is technically a chain, but its theaters around the country are franchises and are independently operated. So while the theaters have some common menu items, they vary their menus slightly from location to location, based partly on regional tastes. In Woodbury, Minnesota, for instance, Mann says the newest Drafthouse location came up with a Juicy Lucy, a “cheeseburger with cheese inside the meat instead of on top, resulting in a melted core of cheese — it’s a Minnesota classic.” There’s also an “amazing” cheese curd starter on the menu. 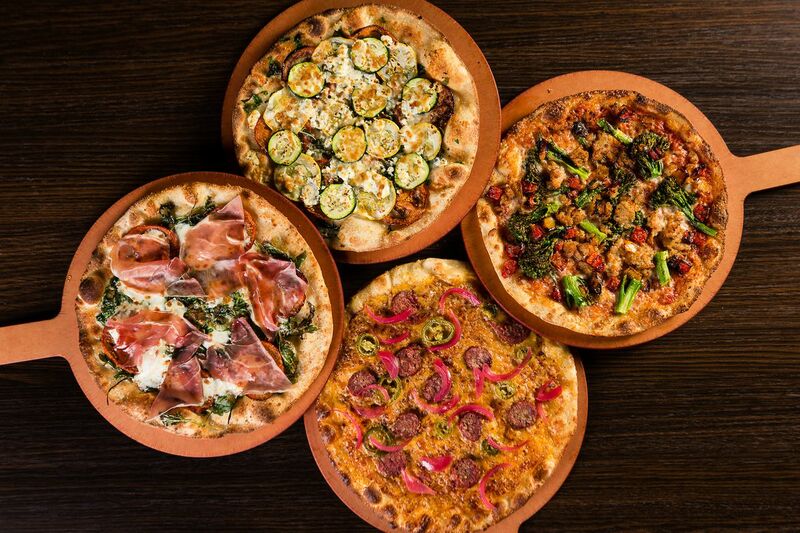 In locations like Brooklyn and San Francisco, the company hires a local chef to innovate within the Drafthouse framework: About 80 percent of the menu remains consistent from market to market, while 20 percent changes based on the location. Even movie theaters that still mostly focus on traditional popcorn-and-candy offerings have thrown in a bit of their own flair. The cinemas at the Brooklyn Academy of Music, for instance, which show both first-run theatrical releases and repertory films, offer brownies and cookies from a local bakery as well as ice cream bars. 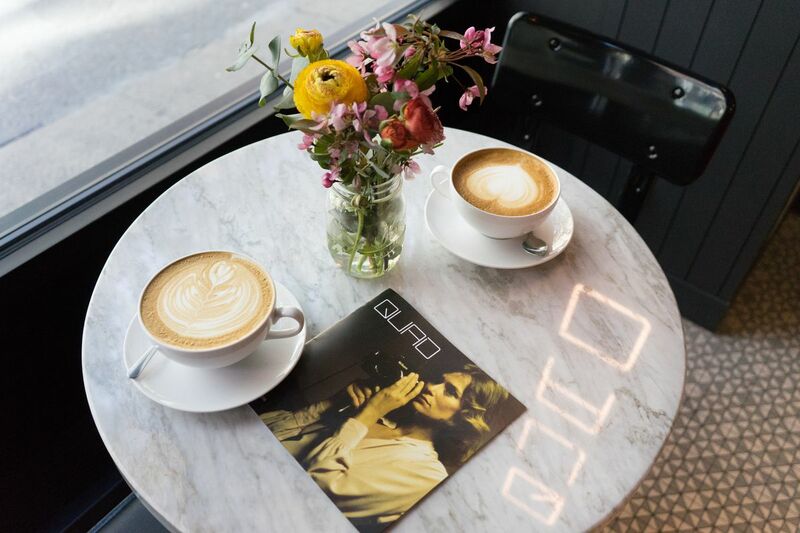 And cinemas such as IFC, Film Forum, and Lincoln Center’s Walter Reade Theater supplement their offerings with baked goods, fancy ice cream sandwiches, and other offerings. The Michelin-rated restaurant at the Metrograph cinema in New York City serves a full meal and bar menu outside the theater. The Metrograph theater — which is probably the most self-consciously gourmand-focused of New York’s theaters, with high-end concessions and a Michelin-rated restaurant — launched in 2016 with the goal of reminding moviegoers of an older golden age of Hollywood, with a distinctly local twist. “I wanted to activate the feelings that I had as a little kid falling in love with the movies as I went to theaters in New York when I was 8 or 9 or 10 years old,” Alexander Olch, Metrograph’s founder and president, said. Olch noted that the concessions in the theater’s lobby include specialty flavors of popcorn created in the theater’s kitchens, candy imported from Asia and Europe, and more. “It has become a place where people also like to get their picture taken,” he said. This wide variety of offerings at various theaters all within a few miles of one another — from traditional concessions to full-out dining menus — wasn’t part of most people’s moviegoing experience just a decade ago. But now, it’s common, and the industry seems to keep innovating. And for many cinemas, the offerings aren’t just a way of bringing in revenue; they’re a way of branding a theater, bolstering its aesthetic, and signaling to customers what kind of moviegoing experience they’re about to have. As a hat tip to Eighth Grade this summer, Nitehawk drew on a scene in which two characters eat chicken nuggets with “all of the sauces,” with a rum-based cocktail called “Things That Look Like a Banana,” a sly nod to one of the movie’s funniest scenes. The indie drama Skate Kitchen, set on New York’s Lower East Side, got a bourbon-based “Skate or Die” cocktail and an everything bagel-spiced arepa with smoked salmon and cream cheese named “Losaida,” a Spanglish slang term for the Hispanic section of the Lower East Side. 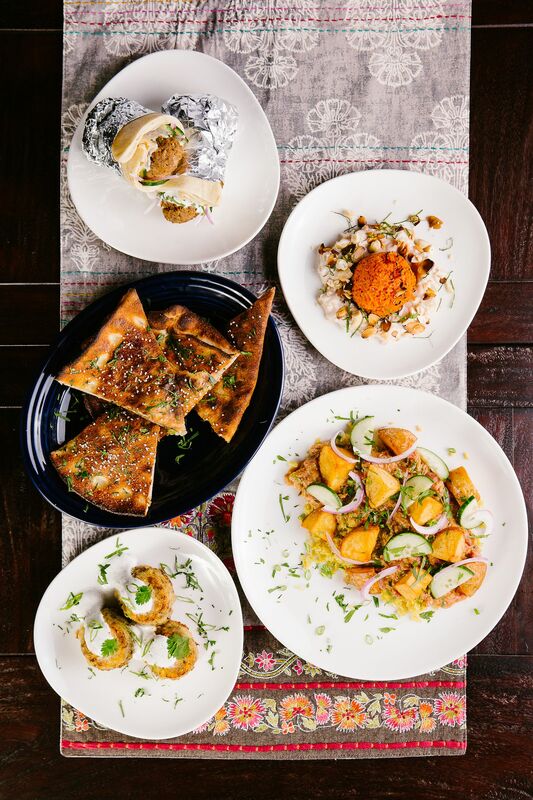 The Alamo Drafthouse enlisted Kumail Nanjiani to devise a Pakistani-themed menu to accompany screenings of his film The Big Sick in 2017. Other cinemas have elected to make their full-dining or bar offerings a separate experience from the movie-watching. That may seem like a familiar concept to people accustomed to going to the movies in a shopping mall and stopping by a food court, a Ruby Tuesday, or a Johnny Rockets beforehand. But those restaurants aren’t directly associated with the theater. And cinemas around the country have been innovating in how they offer food outside the theater, too. In addition to Alamo, chains like Movie Tavern and Cinebistro offer food and drinks both in the theater and in the adjacent restaurant, depending on the location. Some restaurants even repurpose spaces that existed already — for instance, the St. Johns Theater & Pub in Portland, Oregon, was first built in 1905 for the World’s Fair; now it serves up food and drinks in the pub and shows movies in the theater. In New York, Metrograph has a cocktail bar in its first-floor lobby and a full restaurant on the second floor, both of which can be visited without buying a movie ticket. 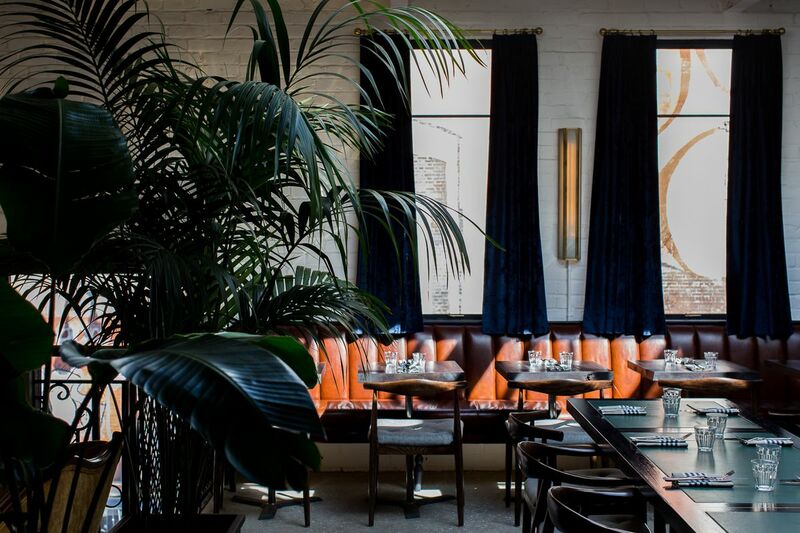 The restaurant, which Metrograph calls the Commissary, was inspired by old-school Hollywood commissaries on studio lots. The restaurant is also meant to be “a place that people come to work, to hang out, to drink, to have parties, without necessarily regard for what the showtimes are” — and then, maybe, decide to stick around for a movie. The bar at the Quad is a place for patrons to hang out before or after a movie. A similar idea is behind the bar at the Quad, which serves up coffee, wine, and beer in a space adjacent to the theater’s lobby, Vásconez says the bar was intended to be a space for cinephiles to congregate before and after films. “Moviegoers could discuss and debate a film they just saw, and also engage in conversation that might inspire them to go see something they might not have otherwise,” she said. But they’ve discovered that the bar has become a bit more. “While the majority of our patrons are film lovers on their way in or out of a screening, we have made plenty of cinephiles out of wandering barflies, due in no small part to our awesome bartenders who know as much about movies as they do about our rotating wine and beer offerings,” Vásconez said. Having a separate, standalone space for eating and drinking at a cinema may seem only tangentially related to the moviegoing. But it’s interesting to note that both the Metrograph and the Quad say people sometimes come for the food and then decide to go to the movie. Certainly part of this is due to the foot-traffic patterns of New York City moviegoers — without having to drive to the movie theater and park the car, spur-of-the-moment decisions to see a film can come easily. This was especially important in the heyday of MoviePass, when a person might have been more likely to decide to see an old, foreign, or obscure film since they didn’t pay the cost of the ticket. MoviePass seems to be headed for its demise, so this may change in the future. Yet it seems likely that having people near a cinema as they eat, drink, and relax — particularly in cinemas that specialize in movies that aren’t being advertised widely on billboards or in trailers — may direct more people into the actual theater. That’s everyone’s end goal: to get people to buy tickets to the movies. Whether cinemas have been tweaking their traditional offerings or going full upscale, it’s clear that the biggest factor has been thinking about how to distinguish the moviegoing experience at their establishment — and food and beverages play a big role. People want to customize their moviegoing experiences, and what they eat is part of that. That matters, because cinemas are struggling once again with how to stay viable. This summer, theater attendance broke records, but the same period in 2017 saw the lowest attendance ever. The rise of MoviePass helped show that people really do want to go to the theater but that movie ticket costs are a hurdle for many. A patron at Metrograph enjoys a drink before a movie. Although adding even more ways to spend money may seem counterintuitive, it’s worked. And that has everything to do with why people go to the movie theater. In the age of streaming, for most people, a trip to the theater isn’t just an excuse to watch a movie. It’s an excursion, a night out, an event. The same, for many people, goes for eating out. So combining the two in ultimately complementary ways has been a success for businesses and customers alike.